Throughout the semester, my Intro to Museums class (HISP200) will be visiting a handful of museums in the Fredericksburg area. This past Thursday we went to the James Monroe Museum & Memorial Library in downtown FXBG. The museum itself is housed in a building (secretly 3 buildings) that was believed to have housed James Monroe’s law office. This early in the semester, the vast majority of what we’ve learned in class is pretty vague – what is a museum? what goes into museums? how do museums decide what to keep, and what not to? Our visit to the museum was focused on a lot of those questions, but most especially on the objects within museums, and how they’re stored, cared for, selected, etc. All in all, I’d definitely recommend anyone visiting Fredericksburg to pay a visit here! It’s lovely and lovingly arranged. 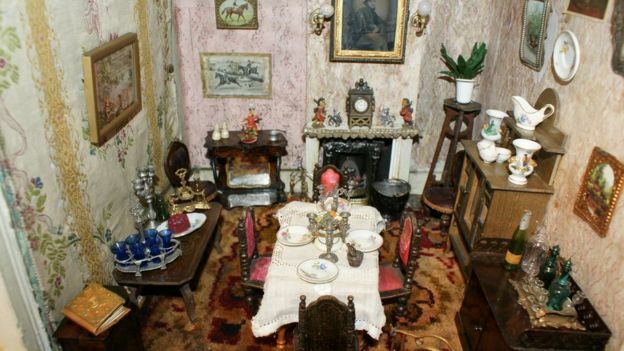 In 1977 Val Ripley and her sister, Pam, found a collection of 170+ years of their and their mother’s old dollhouses and dolls in the attic of their recently deceased mother. Within the collection were furnished dollhouses of “every period from 1840 … represent[ing] a complete social history.” In addition to this collection, the sisters obtained numerous miniature toys to accompany and accentuate their dollhouses, before opening their collection to the public in 2010. Now 93, Ms Ripley has bequeathed the collection to a Pembrokeshire museum, where a new permanent gallery suite will be created to house it. The gallery will be located at Scolton Manor, near Haverfordwest, and will be funded by a Welsh Government Grant over £75,000. Recently in my intro to museum studies class, we’ve been spending a lot of time examining how a museum decides what to – and what not to – include in their collection, and how they go about receiving donations. This article by the BBC is highly relevant to this topic in that, while the author spends a large amount of time referencing the personal relationship of the Ripley sisters and the collection, they don’t get into whether or not these items have documentation on their origins. Similarly, they don’t mention what other information may have been provided to the museum receiving the collection. This means that large portions of the information on this collection will be primary hearsay and personal experience from the Ripleys, unless the museum expends funds to pursue their own research on the topic. But with such a unique collection, the fruit of such labor will likely be quite worth the effort.